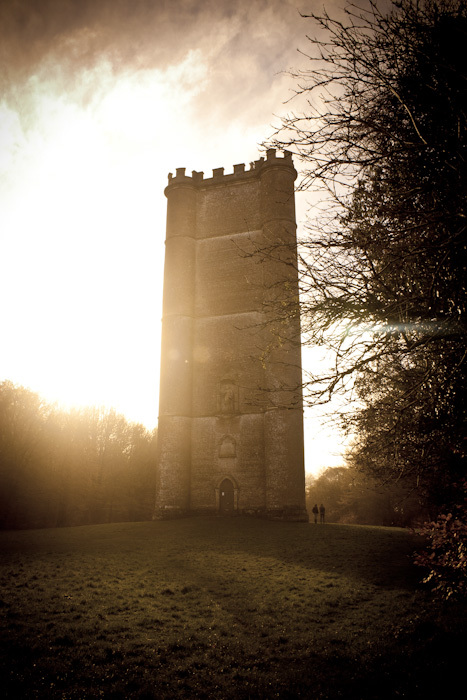 Stephen Riley Photography: Somerset: King Alfred’s Tower, near Stourton, Somerset. Travels of a Tameside Photographer. King Alfred’s Tower, near Stourton, Somerset. Here’s a bit of unalloyed Romanticism for you. This is King Alfred’s Tower. It is notionally just in Somerset; it is also part of the Stourhead Estate in Wiltshire; it seems to be right on the border of the two counties. It commemorates and is believed to be approximately in the location where King Alfred rallied his army before defeating the Danes at the Battle of Ethandun in 878 AD. Built on behalf of Henry Hoare, as the crowning part of Stourhead Gardens, it is also a folly that was built for the pleasure of that wealthy family. The monolith makes an amazing viewpoint. There is access at certain times of the year; sadly not when I was there. It stands 160 feet high – pretty big for a folly – and was designed by the famous architect Henry Flitcroft and completed in 1772. Its location in the leafy English landscape and its associations with that semi-mythologised past seem to make a romantic depiction inevitable.